We've all seen it before -- the impending cry. At a moment when you least expect it, a bride or groom will suddenly become hushed -- their face will start to scrunch a little, or a once-resolute chin will quiver, or, with no warning, a huge crocodile tear will start that rivery path down the side of a cheek. When Adam read that note from Natalie, his bride, we knew we had just witnessed a truly special moment (and you can, too! watch their full wedding film!). Some people enter their wedding with a certainty that they will or won't cry at some point over the course of the day. In our experience as wedding professionals, however, the emotions can hit a bride or groom at any point, and suddenly, there's no turning back -- if you're a bride and you're in the make-up chair, your artist will have lots of great suggestions to prevent your make up from smearing, like, "look upward" or "hold tissue just at the edge of your eye, but don't press or wipe, just let it absorb." Some people don't want to cry, and are determined not to, and they fight it---I've heard some people comment that they are afraid of the "ugly cry" face they might make. I happen to be of the firm belief that when it comes to happy tears, there's no such thing as an "ugly cry." Happy tears are only beautiful. So embrace the happy tears! These are precious moments, and you need to live in the moment, fully aware of what you're experiencing on your wedding day! Here's a beautiful moment where Tara opened up her gift from her groom - a Cartier Love bracelet. Her happy tears were so sweet, it's the moment we chose for the opening scene of her wedding film. Alex chose to give her this bracelet both because she had always admired it, but also because their relationship started with the gift of a bracelet. Watch her full film here. In the spirit of embracing a beautiful cry, we want to share this next wedding video clip from the heirloom feature commissioned by one of our recent clients. Kellye is a bride who, with an open heart, truly embraced the emotions of the day, and one of my favorite moments from her wedding came during her father's toast. As he spoke about how he's looked forward to this day, he described that as Kellye grew up, waking up to her presence in their home everyday was "like Christmas morning, every morning." And if that wasn't enough to melt your heart, what happened next most certainly will. Don't you just love that? 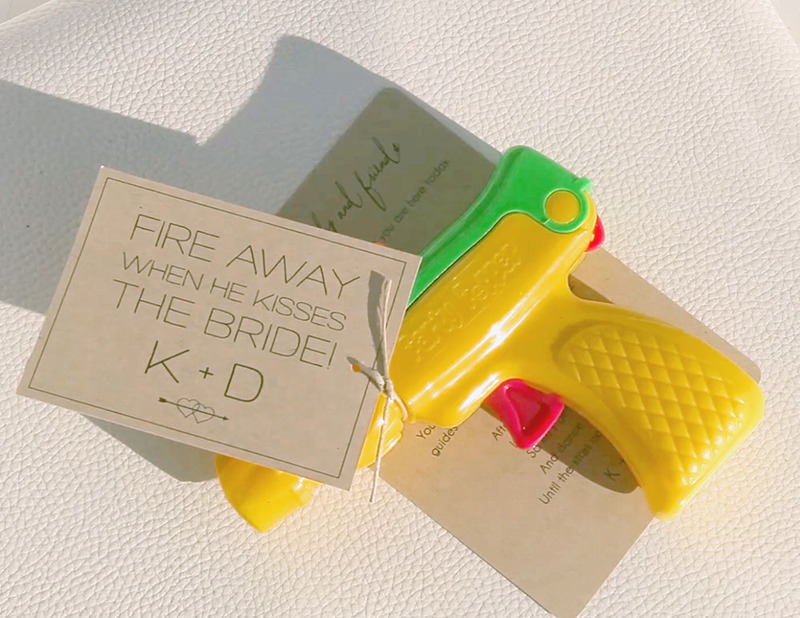 We also thought that the confetti guns were a great way to celebrate the wedding ceremony kiss at an outdoor backyard wedding. You can watch the full wedding video here.